We have already discussed the details of Vernier Caliper least count. 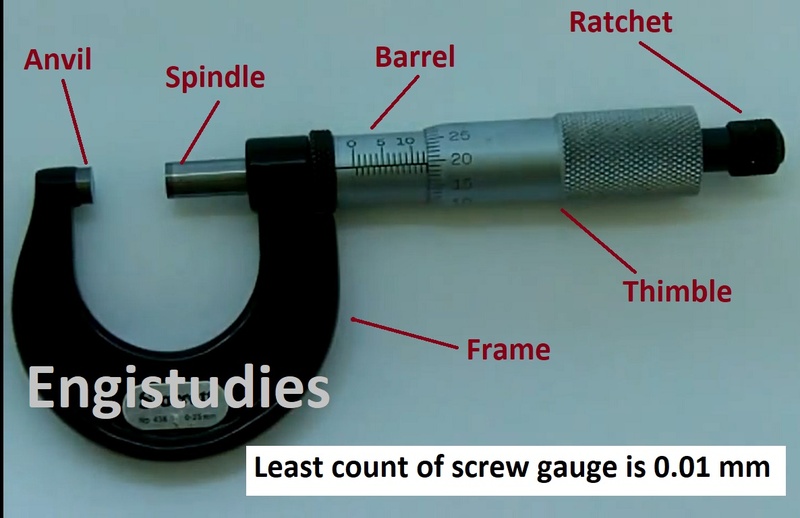 Here we will discuss another measurement instrument called 'Micrometer screw gauge'. Least count of screw gauge is 0.01 mm. The diagram shows a metric micrometer and nomenclature of its parts. 0.5 mm is the min main scale division value and a circular scale is divided into 50 lines. We can now get the answer by dividing the values as per the above formula. Before taking the reading on micrometer check if it has any positive or negative zero error. If it does have then re-calibrate it. Avoid directly rotating circular scale. Instead, use the ratchet to get fine measurements. The part should be free from burr.